Like Guy, I have no burning desire to rush out and see Superman Returns, but I probably will see it as we’re out of town for an all star baseball tournament this weekend and we’ve got a huge gap between games on Saturday. When the idea arose my oldest says to me, “Hey Dad, since we’re going to see Superman and it’s an all star tournament we can call it ‘All Star Superman’ – like the comic.” [sniff] The apple doesn’t fall too far from the longbox. In truth, I don’t see many movies at the theater anymore. I haven’t seen X3 and will probably wait for the DVD. I can’t actually remember the last movie I saw in a theater although I think it was Fantastic Four, and that was because my son really wanted to see it. I could have easily waited for that one to hit the stores. (Although I did enjoy it.) In fact the last three or four movies I’ve seen we’re with my kids. The thing about Superman is that there’s nothing terrifically compelling about the actual execution of the film. I wasn’t a whole lot older than my oldest when the first Superman movie came out. As a comic fan my biggest fear was that it would be dopey and poorly done. There didn’t seem any way they could make a movie believably depicting the last son of Krypton flying or throwing buses around. But they did. And Reeves actually looked like Superman, although played with a little too much wide-eyed farmboy innocence and purity for my taste. But the effects rocked! You know, for 1978. I lost a lot of interest after that first movie. They showed they could make Superman look real and that was enough for me. It’s another task entirely to tell fascinating Superman stories, as decades of comic writers have proven. And the fact that this one seems once again to focus on the origin, rather than telling some new story. Hopefully it's more than that. Now if you were to tell me this movie captured the feel of what Morrison has been doing in ALL STAR SUPERMAN, well, even I might get excited about that. I think it’s important to talk about CASANOVA and THE FIVE FISTS OF SCIENCE at the same time. Mainly because I’m about to take some shots at CASANOVA so I’ll feel better about myself if I have something nice to say as well. I was sold on this title months ago when I first saw the advert showing a Bond-like character firing handguns as he fell backwards out of a UFO. I am very much buying this, I thought. Sadly, I found the first issue of CASANOVA just plain painful. (And it’s not even a real UFO – dangit.) I think my problem with the book is my incessant need to understand everything I read. I can get by without knowing the mysteries of the universe or understanding women (like I have choice) but when I read something I damn well want to know what’s going on. And with CASANOVA you never really do. Fraction seems to have taken every wild idea he’s ever had and compressed them into CASANOVA’s 32 neat little pages. Genome bioreaders, recreational supermechanix helicasino’s, n-state probability caps, aural anomalies, timeline insertions and there’s even a plot of sorts in there somewhere. It all sounds pretty cool but it felt like he was trying a bit too hard to bring across this whole Phil Specter does comics thing. There’s a boatload going on here – too much for my tastes. It needed a bit more harmony and less cacophony. Maybe I’m just getting old. All this is tempered, by-the-by, with some marvelous Gabriel Ba artwork. Disclaimer: judging from the various reviews I’m about the only one who didn’t love this book, so take what I say with a grain of salt. THE FIVE FISTS OF SCIENCE is another matter entirely. I’d swear this thing was written specifically for me. Mark Twain, Nikola Tesla and an evil JP Morgan and Thomas Edison? Are you kidding me? Years and years ago there was an entertainer named Jaye P. Morgan who used to make regular appearances on The Gong Show and Match Game. As a kid I found her totally annoying -- not Brett Somers level annoying, but real close -- and from that point on I’ve had an irrational dislike of the original JP Morgan, who is, to the best of my knowledge, no relation. Equally, when I was twelve and going through my I’ve-decided-to-be-an-inventor phase I read a book that detailed the whole Tesla-Marconi ordeal and have been sympathetic towards the reclusive Mr. Tesla ever since. And yes, I’ve read and loved plenty of Twain. So, to say this book pegged the needle for me would be putting it mildly. The whole concept is fabulous. Smart, funny, well-conceptualized. Fraction manages to take some of the most quoted, documented and written about personas in history, instill his own unique breath in them and then send them careening out in one of the more original turn-of-the-century era stories I’ve ever read. And he's funny. Dear Sir: I have, as you say, been interested in patents and patentees. If your book tells how to exterminate inventors, send me nine editions. Send them by express. 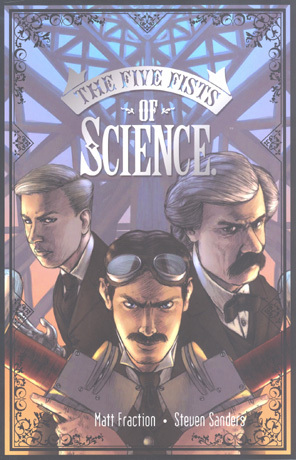 It’s not hard to imagine the events in THE FIVE FISTS OF SCIENCE playing a part in Twain’s later acrimony. Steve Sanders' art is excellent here as well. The panel layouts are standard stuff, which really work towards setting off the very rare full-page spread and the visual storytelling never distracts from the script. My one quibble is that in a number of places the black background of the panels washes out against the darkness of the panels themselves, but in other places this works fine. I’m not sure there’s a ready solution to this problem and not a major distraction. A fun book all-in-all, well worth the $13 price of admission. So, it’s been a while. Anything interesting happen while I was gone? Week 7 already with 52. That sentence doesn’t make a lot of sense outside its comic book context. I don’t think there’s any doubt that Montoya & The Question (sounds like a bad 80’s cover band) are carrying 52 right now, although the TO Morrow and the lost scientists thread is running a close second. The Steel storyline is going somewhere, but it’s moving soooo slow (is Brian Bendis plotting that one? ), Booster Gold hasn’t worn me out yet, but I can see it from here and the whole Cassie/Conner Cult thing is so damned goofy and from far left field that it’s almost got me interested. Almost. This latest issue doesn’t drop all the little plot hints that week 6 did -- the two page spread of Rip Hunter’s time lab is my favorite of the series so far -- but it does manage to move the story(ies) along. I can say now that The History of the DCU is an unquestionable failure. What exactly is the point of this? It's incomprehensable to anyone not vested in the DCU and a waste time to those who are. Despite this, the book has me interested enough to follow for another month or two at least. One odd thing that occurs to me with this book: there’s a great deal of hint dropping that time and/or reality is slipping or at least not what it’s supposed to be; the scenes with Booster and Skeets in particular hint at a the wobbliness of the current time-line. And yet this book may be the single most clock and calendar driven title in the history of comics. There will be a certain irony if we reach the end of this series and discover that a full year has not really passed in the DCU after all. Speaking of being away for while, JUSTICE #6 was surprisingly slow for a bi-monthly book. Although it had some nice, silver-agey moments. I really like what Mark Millar has been doing in THE ULTIMATES 2. Dollar-for-dollar there have been more F@*% Yeah! moments in the last two issues of this book than any five others combined. Joe Quesada has a blog now? I give it three months at the outside. Six if it’s not actually him writing it. Here’s an interesting article in the Detroit Free Press about the increasing attention the big dogs of advertising are paying to comic books. Or rather they’re paying comics to get people to pay attention to them. Product placement, baby. Learn to love it. DC’s newest crime stopper, RUSH will apparently spin around town in a Pontiac Solstice when he’s not hosting a conservative, daily radio program. I may not have that last part right. Check out the article if for no other reason than to see the single worst on-line reproduction of a comic book page in the history of the Internet.